Hope all of you are having a great time 😊! 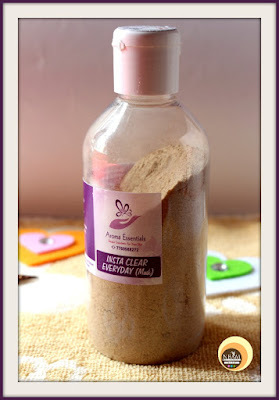 Today, I am going to review Aroma Essentials Insta Clear Everyday Mask which I have been using for a couple of months. This product, in reality, is a two-in-one product, means it acts as a Scrub & a mask; scrub-mask. How cool is that? So to know more about this mask, please keep reading! 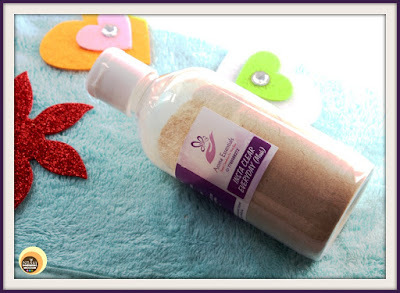 Aroma Essentials is an Indian brand based in Bangalore which provides solutions for skin care and hair care and is run by Mr Ramakrishna & Mrs Madhurima Ramakrishna. The products are completely natural, handmade & fresh. You can check out their official Facebook Page here. Aroma Essentials Insta Clear Everyday Mask is an artificial fragrance-free and a chemical-free mask made with finest natural ingredients. This mask is dermatologically tested and is not tested on animals. It is not a medicine and is meant for topical use only. Claims: Helps in fading post acne marks and hyperpigmentation due to sun damage. Aroma Essentials Insta Clear Mask is fortified with skin-loving ingredients like Fenugreek, Red Lentil, Orange, Sandalwood & Neroli essential oils which play a key role in maintaining skin’s beauty. Fenugreek – has anti-ageing benefits, moisturizing, cures acne. Red Lentil – acts as an exfoliator, helps banish pigmentation and acne scars. Orange – boosts collagen production, has antioxidant & anti-aging properties, reduce acne and dryness. Neroli oil – great for brightening, acne-prone & oily skin, rejuvenates skin and reduces blemishes, wrinkles. Sandalwood oil- alleviates skin inflammation, best for oily skin, tightens pores, and fades away scars, tans and discolourations. Mix with water and apply a thin layer, leave for ten minutes and rinse off (for people with dry skin, mix with Aroma Essentials face wash, as recommended). Use daily. I was dealing with acne scars, hyperpigmentation, uneven complexion and tanning prior to using this product. I had gone for deep consultation with the founder & formulator Mrs Madhurima who listened to my skin concerns patiently and then sent in products according to my skin type and issues. I would highly recommend you to do the same before you place your orders at Aroma Essentials. This Insta Clear Everyday Mask comes in a plastic, transparent bottle with a firm flip top cap. It is further secured with an inner lid to prevent product spillage while travelling, thus travel-friendly. There is a small opening in the top cap so that once you remove the inner lid; the product can easily come out of the container. All the necessary information about the product is labelled on the packaging. Overall, it has a decent, practical packaging. 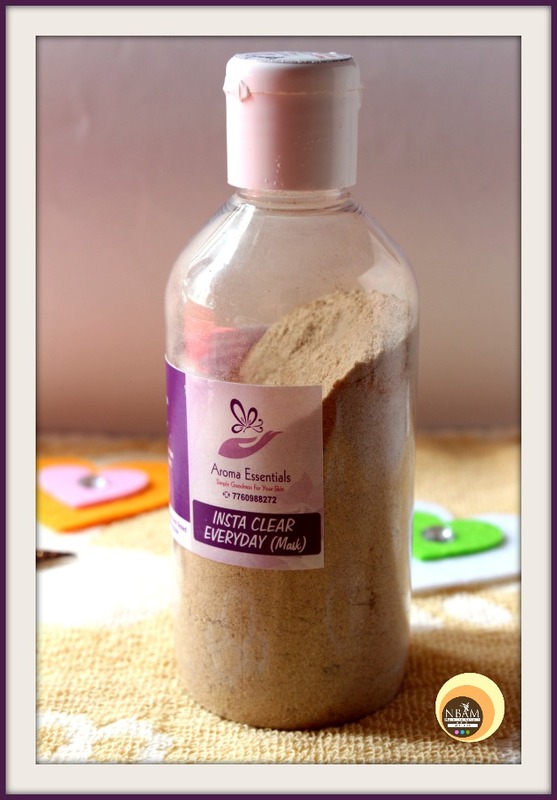 Aroma Essentials Insta Clear Mask comes in a dry powder form. 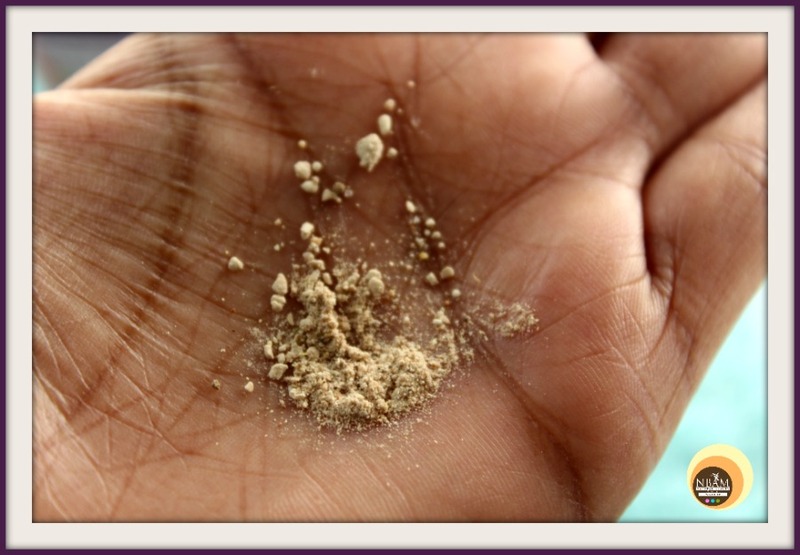 Being made with finest natural ingredients like fenugreek and red lentil powder, it has a dusty texture. 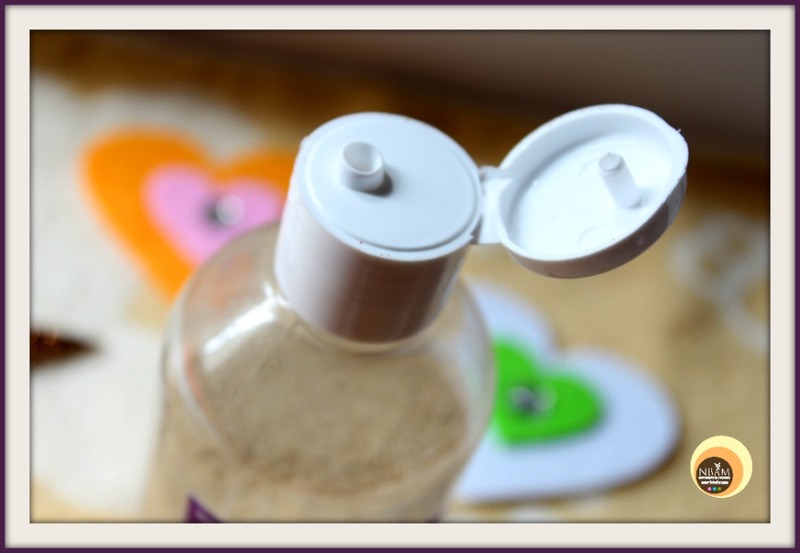 It also contains essential oils so upon application releases a pleasant herbal fragrance. When I started using this product, it was winter season and my skin becomes dry during that season. So at first, I used it with Aroma essentials Orange Splash face wash meant for dry skin as per the given direction. When applied on face, it gave a strong tingling sensation to the T-zone area, so much that I had to wash my face immediately. I applied the same way again next week but faced the same irritation. Lesson learnt! Then I decided to mix this mask with milk and voila! It works great that way😍. I also tried mixing it with rose water and it does its job well. I think for my skin type, milk & rose water are perfect. Post usage, I follow it with Aroma Essentials Saffron Facial (cream) Mask. Aroma Essentials Insta Clear Mask is an everyday mask but I don’t use it daily because this has exfoliation properties. As I mentioned in the anchor that it acts as a scrub-mask, I prefer using it every alternate day. A little quantity of this Insta Clear Mask is enough to suffice the purpose. I keep this mask for around ten minutes on my skin before washing it off with tepid water. The fine granules do not irritate the skin, however, make sure you scrub your skin gently while removing the mask. You can see the difference from the first use itself. I was completely blown away by its performance! It not only provided me with a clear, glowing skin but evened out my complexion by removing the dead skin cells, tanning & pigmentation!! I had dark un-even patches, discolourations here and there around my mouth & forehead, this Insta Clear mask has completely cleared out those discolourations. Coming to banishing BLACKHEADS, it's great!! I do have a little bit blackheads and whiteheads on my nose area which I tried eradicating with various homemade DIYs. But I couldn’t get that perfect result with any of those remedies. However, when I used this mask all over my face (paying particular attention to the T-zone), post-wash, I got what I longed for – a beautiful, sharp nose (err!!) without blackheads and whiteheads!! YAY 😍. The effect lasts for 3-4 days, so using this mask twice a week is as good as using it daily. I didn’t stop there; I applied this mask on my guinea pig, 😜 (OOPS!) husband’s skin also to find out how it performs. He has (visible) large pores around his nose with severe blackheads. So it took time but gradually this mask helped reduce those evil blackheads. He loves this Insta Clear Mask to bits 💗. Besides, this mask also helped incredibly in removing the tanning from my hands and feet! Availability is an issue in Hong Kong. At present, they don’t have any specific website for their brand but have a Facebook page named as ‘Aroma Essentials’. Good news, they do provide international shipping, so you can easily place your orders there! It couldn’t heal those deep acne scars 😥! In short, I cannot get enough of this Insta Clear Everyday Mask 😍. Ever since I have received this product, there isn’t a single week I skipped it. 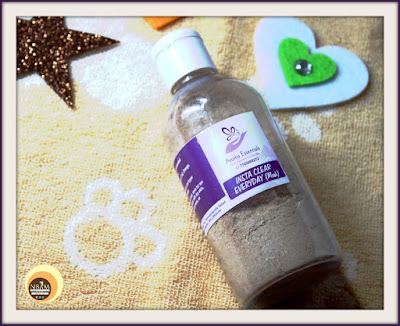 This instantly brightens up the skin, keeps blackheads & whiteheads at bay and removes tanning & discolourations eventually making your skin look and feel Clean, beautiful and radiant. I wish it could heal my dark acne scars but this point can be ignored considering its positive effect on other skin issues. I am elated to get that opportunity to try out this mask and shall definitely repurchase it 😊. So what are you waiting for, go grab it, pals! Have You Ever Tried Aroma Essentials Insta Clear Everyday Mask? If Yes, Please Share Your Experience With Us In The Comment Section Below. #PR sample but my opinions are 100% honest and my own! My kinda product. Two in one sounds awesome. I too struggle with blemishes and blackheads, speak about those on my nose. I like that fact that it contains essentials oils. Fab. Wish I can get my hands on it for my beauty face purposes. i also have few blemish marks due to change in weather...this sounds perfect to cater to that.. It sounds like a very impressive mask. Glad to hear that it worked out for you. Sounds like a great product for my oily and tanned face. Beautifully reviewed. Very detailed. I love the texture of the product ... I think I can also give a try on it this summer :) thanks for sharing honest review. I didn't use this brand before but it sounds good. Nicely reviewed!! 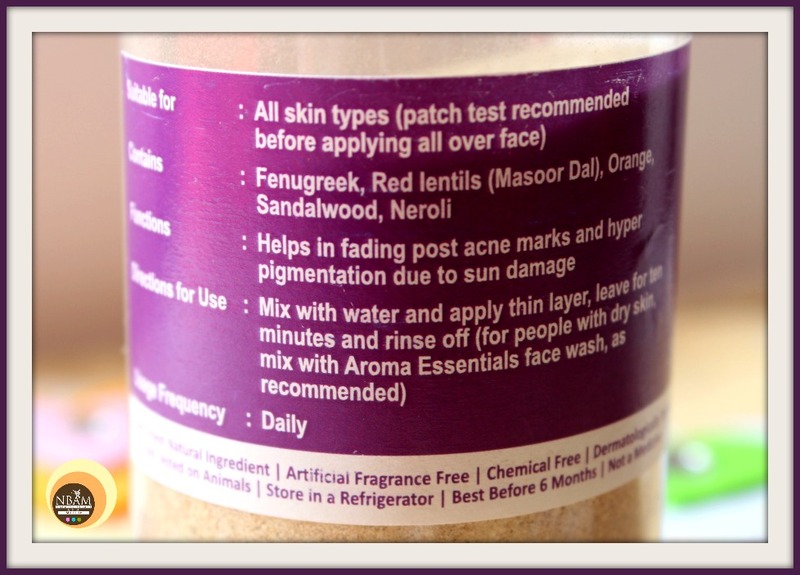 I like the ingredients and it's good that it can heal acne. I like that there's now a mask and scrub in one. This mask is really good. I use Prasadhak aroma essential oil afetr washing off this mask.